Home / Elections / India / Latest Post / Opinion / Politics / 2019 General Elections - How It's Panning Out For BJP? 2019 General Elections - How It's Panning Out For BJP? Yesterday one of my close friends shared his views in our engineering group’s Whats App board on why he thinks Narendra Modi would do an Atal Bihari Vajpayee and hold the general elections earlier than 2019. Though I don’t entirely agree with his reasoning, he still had some valid points. They were politically viable and possible too. In nutshell what his argument was, to cover the shortcomings of the government, Modi may want to hold the election earlier which otherwise would give time for the voters to realize the shortcomings and vote against his party. In cricketing parlance, stay a couple of feets ahead of the popping crease while batting to negate the swing. Don’t give the ball time for the lateral swing to take effect. I see the logic in what he said. But at the same time I have my own beliefs that in all likelihood the election may not get preponed. If at all it does get, it won’t be more than by 3-4 months at the maximum. So, how about analysing how 2019 shapes out for BJP purely in terms of numbers to see if the aspersions of my friend really fit in? A good starting point of the analysis would be 2014 election results. The figure in the right lists BJP’s numbers across all states and union territories. The rows highlighted in red are the states/UTs where BJP has either maxed out or almost maxed out. The sheer percentage of red shade in the table suggests that BJP had its best in many states in 2014, more so the politically important states. In fact states like Rajasthan, Goa, Himachal, Gujarat, Uttarakhand, Delhi and few other UTs had a 100/100 result. So when it comes to 2019 these states can only add to the deficit in BJP’s numbers. And anyone would agree, getting 100/100 results in these states in 2019 won’t be easy, if not impossible. A conservative estimate would put the deficit somewhere around 10-15% at the minimum. That is 12-15 lost seats in these states alone. And remember, most of these deficit seats would be those of its own, not the allies. There are other states like Madhya Pradesh, Haryana, Jharkhand and Uttar Pradesh where the party seems to have almost maxed out. If there is an absence of miracle, I see BJP numbers only going down in these states as well. I mean cracking 71 out of 80 seats in Uttar Pradesh is almost impossible. Though both vote share as well as the seats won by BJP in recently concluded legislative election in UP still points to the intact popularity and numbers but we all know how state and general elections have their own way of interpretation as far as the voters are concerned. I would be utterly surprised if BJP manages to even stick to the number they won in UP, come the 2019 elections. Same could be said about MP, Rajasthan, Haryana and Jharkhand. Again if one wants to be conservative, he still wouldn’t stack the deficit in these states for BJP anything less than 30 seats. In total, in these states where they either have maxed out or almost there, BJP could end up losing close to 65-70 seats. That is a big chunk of numbers. And no one better than Modi understands this mathematics. To even match his party’s success of 2014, Modi has to find that extra 40-50 seats somehow. But the big question is – from where and how he would manage those seats which he most likely would lose in other states. Now from here, my friend’s arguments starts to shake a bit and I will tell you how. But first the analysis, then we would counter my friend’s opinion. Let’s start zone wise. South part of India was always a nightmare for BJP. 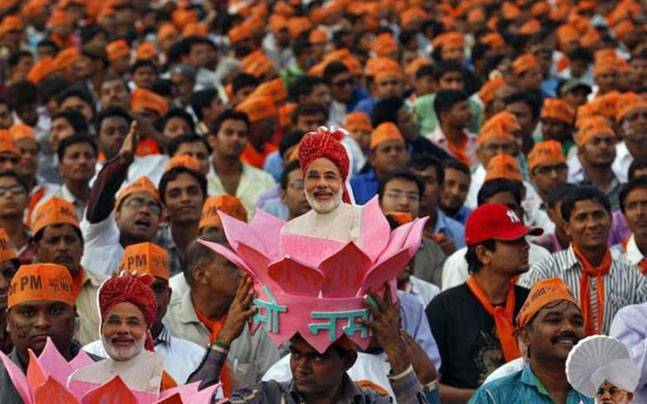 Winning south could be the last bastion for Modi and his party. Momentarily they could assume office in Karnataka but promptly gave it away on a platter to their opponents. Karnataka has another interesting trend in national politics. Over the years, any party which went on to form the government at the centre has done badly in Karnataka, exception being 2014 elections. But then, these are just statistics and they hold not much significance than plain superstition. Breaking this superstition, BJP did fairly well in Karnataka and even better across India last time. After losing the state barely a year back to Congress, BJP could still manage to win 17 of the 28 seats in the state and I consider it as some short of achievement. And knowing the performance and popularity of the present Siddaramaiah government, I can foresee the tally increasing from 17 in the seats column. If I be safe in my prediction, I would account for 5 more seats at least from Karnataka. A person/government that can’t even defend the seats which they won in the state elections a year back may not be that effective in the defence after completing their tenure. As is, the Karnataka elections next year would make the picture little clear – first reason why Modi may not be even be thinking about an early election at present; not only because of Karnataka but also for other important states that would be going to poll in next eight months. Second important state in the south region, that has of late emerged as an important state for BJP is Tamil Nadu. BJP as a party is a non-starter there. Not only they are a non-starter but also look like a non-starter for some years to come, might be even a decade and half. Only way forward for BJP here is their allies. DMK is in shambles, both in internal party management and corruption charges. AIADMK is no better but they have a slight advantage since they have hardly governed in their present tenure. They were busy managing their in-fight. So the fence sitters in the state would still be wondering where to go. And let me assure you, BJP has high hopes from this political mess of the state. If the partnership between Paneerselvam and Palanisami works out, minus Shashikala N, it is a win-win situation for both AIADMK and BJP. Rajanikanth as a political player with all possibility of supporting BJP if required can’t be ruled out either. If all goes well, BJP could easily expect 25 seats from the state. But for this to happen, the partnership must gel well between the two big ‘P’ of the state till the general elections. Second reason why Modi would want to wait and watch before deciding on the early elections – a fractured leadership at AIADMK would act negatively and benefit Modi’s opponents than helping him. He would make sure the equations are intact before deciding on an early election. But as all know, every partnership requires some time to mature and solidify. Modi would definitely want to give the upcoming TN partnership that much time before taking a call. Or else Rajanikanth getting deployed as a destroyer of every political punditry is inevitable. So if all goes well, 30 seats of the deficit numbers are recovered from the south zone itself. Now let’s move on to the East Zone. Odisha plays a key role here to my delight, simply being from the same state. Save this line of mine – I won’t be surprised if Modi fights one of his seats in 2019 from Bhubaneswar. It has both political and sentimental values. It is no doubt that the present BJD government in the state has turned little unpopular. After three terms at a stretch, political incumbency is bound to play a role and BJD seems to be learning this to their utter despair. The recently concluded Panchayat elections, BJP made sound inroads to typical BJD vote base. Emergence of a known and well accepted BJP leader in the state and potential CM candidate has added to BJP’s benefits. In all likelihood BJP would take their tally in the state to 10 from 1, if not more. And hence the third reason why Modi won’t want the elections early – he would prefer the dissatisfaction of the voters for BJD to grow. Second, he would want his party to work more at grassroots and consolidate further, which definitely warrants time. Quick election would negate both. And Odisha is extremely vital for BJP. The joint state-centre election in Odisha also would play to BJP’s advantage. A notable dissatisfaction may even push the fence sitters to go with BJP and we all know how public sentiments play a vital role in helping the indecisive to make up their mind. I don’t see a reason why Modi would want to part away with this advantage. And looking at the way BJD as a party carrying itself and not learning from their mistakes, more the time given to them more they would implode within. So till now 40 seats seems to be recovered from the deficit. Next important state in the eastern part is Bihar. I don’t have words to elaborate how knitting in Nitish Kumar is the political masterstroke of last few decades. More than bringing him into their side, the manner the alliance broke with Lalu has a bigger role to play, not just in state but also central politics. In one stroke BJP did manage to cull many upcoming impediments; vital being the destruction of a possible ‘Mahagathbandhan’ of the opponents in 2019. The manner Nitish Kumar went away citing the corruption as his point of concern; it too killed the notion of secularism totally. In other words, he almost challenged people of Bihar to choose either secularism or corruption, and I must say; he is winning the mind game. So here comes the fourth reason why Modi won’t want an early election – he definitely would want to give Bihar voters’ adequate time to realize that the decision of Nitish Kumar was for their own benefit only. And for people to believe so, JD(U) as a party, need to go door-to-door in convincing people, the reasons of the fallout and no wonder, the said effort would take some time. Certainly close to a year at least. Talking about numbers, I won’t be surprised if BJP+ even makes it 40/40 in the state and many would agree with me. So, 55 seats are recovered already. This leaves two other states in Maharashtra and Assam to pitch in with their numbers. Assam for sure would see big gains for BJP. From my side I would add at least five more seats from the state. Sonwal government is extremely popular and it is on the rise. And it generally takes at least two years for any political assimilation to change. Maharashtra is another state that would see a positive swing. I see 15 seats more at least getting added to BJP’s kitty. The all likelihood of NCP coming to NDA folds may even see a clean sweep for BJP+. And I am sure; a cunning politician like Sharad Powar won’t be in a hurry to take a decision on joining NDA though he being a power hungry politician is not in doubt any more. So, the fifth reason why Modi may not want an early election – just to have a lengthier time to gamble and possibly arm-twist Sharad Powar to come by his side. He would want to do it swiftly without making it too obvious. And such political manoeuvres take time and I don’t know why Modi won’t give the required time when he has it with him. There you go another 25 seats to the tally. So, 80 seats added to the deficit which makes it even surplus; a surplus by good 12-15 seats. Now coming to the point of unemployment and other concerns around which my friend built his debate – to counter these every government in power, not just BJP and Modi, have a powerful tool in their hands. And that is called relief in direct taxation. All these concerns on employment and other related anomalies deal with the vast middle class of the country. And even the staunch supporter of Modi and BJP would admit that they have done little or nothing for the middle class. All the more reason why we can expect pleasant surprises in 2018. Knowing Modi, he won’t let go this huge vote bank of his unattended. As is, nothing impresses the middle class more than the relief in direct taxation. GST is through which has fixed the indirect taxation to some extent and people would realize the benefits in the long run as argued by many pro-government economists. What Modi can do in next budget is to give huge tax relief to the struggling middle class and I am sure, much of these media created worries would be forgotten by those who matter. We may argue on this in whichever way we want but this is basic politics. Address the most burning concern at the last and be a hero till they queue in front to cast their votes. Hence the 2018-19 budget would be vital and no one better than Modi who understands it. I can foresee good measures to make the middle class feel happy, at least to the tune that they don’t forget it till they vote next. In nutshell, I predict another massive win for BJP in 2019, of course without any prepone in the election schedule. In 2014, much before the elections, I predicted majority for BJP on their own and I was bang on the target to the last number of seats the party won. So sticking my neck out again, below is what one can expect, come the counting day in 2019. Congress – Does it really matter?